On June 2015, Home Development and Mutual Fund, more popularly known as the Pag-IBIG Fund (Pag–IBIG is an acronym which stands for Pagtutulungan sa Kinabukasan: Ikaw, Bangko, Industria at Gobyerno), released updates of their housing loan guidelines for their affordable shelter financing program. Their notable amendment is the removal of loan availment limit. Previously, you can only borrow a single housing loan even though you have the capacity to pay. 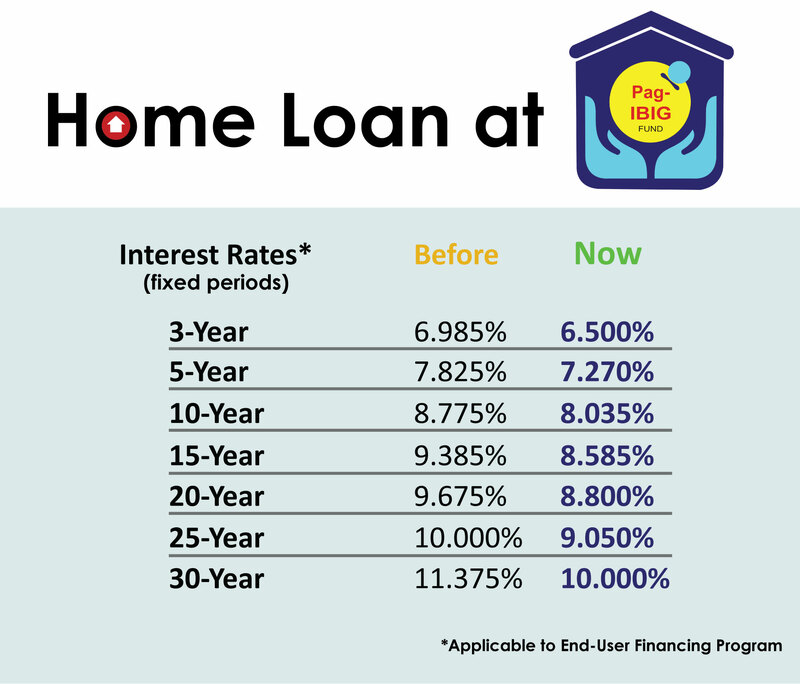 Now, you can have multiple housing loan as long as one does not exceed 6,000,000 pesos (aggregate loan value — the outstanding balances of existing housing loans and the loanable amount of the new housing loan) and the resulting amortization payments for all loans are within the borrower’s capacity or income to pay. It is also applicable if one is a co-borrower for tacked loan. This is a welcome news for those who are restraint to acquire and build their real estate assets. Another update is the lowering of borrowing rates. You can now borrow with annual interest rate of as low as 6.5% guaranteed interest rate for the next 3 years (comparable with bank financing), this will be repriced after 3 years. See above for other repricing periods. Choosing the comfortable repricing periods can mean interest payment savings or protection from rising interest rate risk. 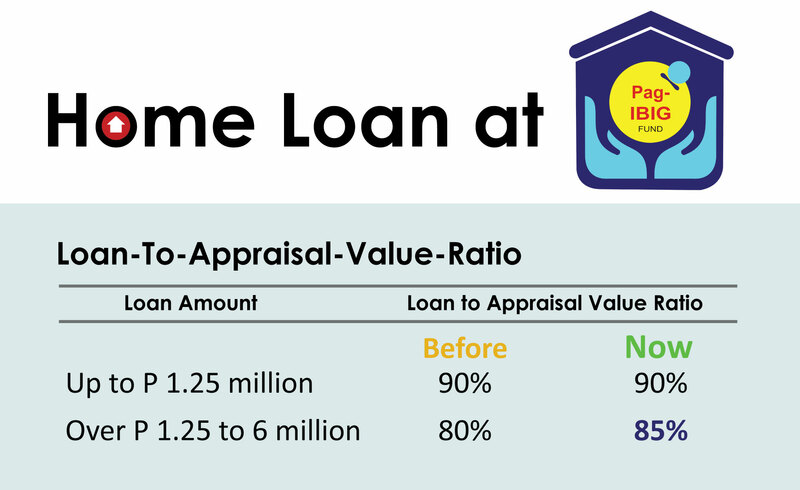 Other updates like the Loan charges see above presentation and the Loan-To-Appraisal Value Ratio (see below). Loan to appraisal value ratio is one of the criteria in determining the borrower’s loan amount. A qualified Pag-IBIG member shall be allowed to borrow an amount up to 6,000,000, which shall be based on the lowest of the following: actual need, loan entitlement based on the capacity to pay, & loan-to-appraisal-ratio. A member’s loan entitlement shall be limited to an amount where the monthly payment shall not exceed 35% of the borrower’s gross monthly income for loans not exceeding P 1.25 million and 30% of the borrower’s gross monthly income for loan over P 1.25 million. The loan-to-appraisal value may be adjusted depending on the results of the Borrower’s Evaluation System. For developer-assisted housing loans up to P450,000.00, the loan-to-appraisal value ratio shall be 100%; provided, the developer’s License to Sell is for a socialized housing project and the borrower’s housing loan purpose is for the Purchase of a Residential Unit. For the purchase of Pag-IBIG Fund Acquired Asset, the loan-to-appraisal value shall be 100%. A maximum of three (3) qualified Pag-Ibig members may be tacked into a single secured by the same collateral; provided, they are related within the second civil degree of consanguinity of affinity. Non related co-borrowers may be also be allowed provided, co-borrower’s are co-owners of the property offered as collateral, and subject to the approval of the Branch Manager or higher level of authority. 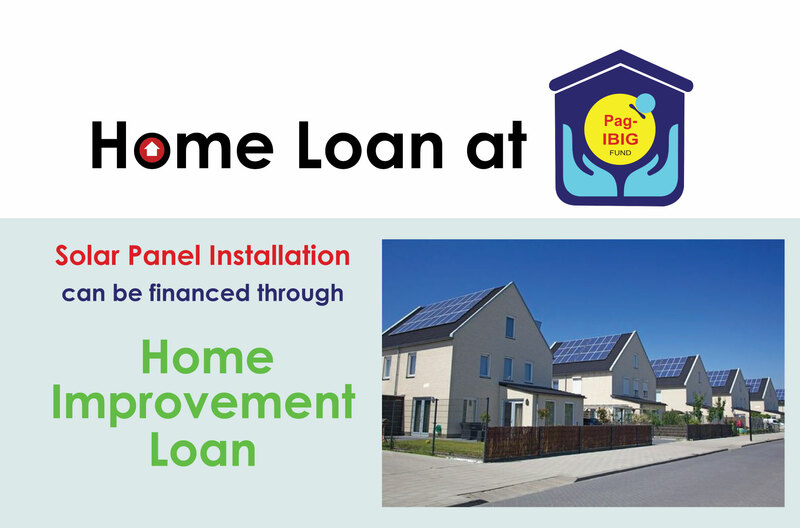 You can now have your solar panel installation of your home financed by Pag-IBIG Fund through their Home Improvement Loan. A welcoming news for those who want to participate and bring the renewable energy/green technology in their homes as this will decrease dependence on the power grid and contribute to the lowering of electricity bill in the long run. 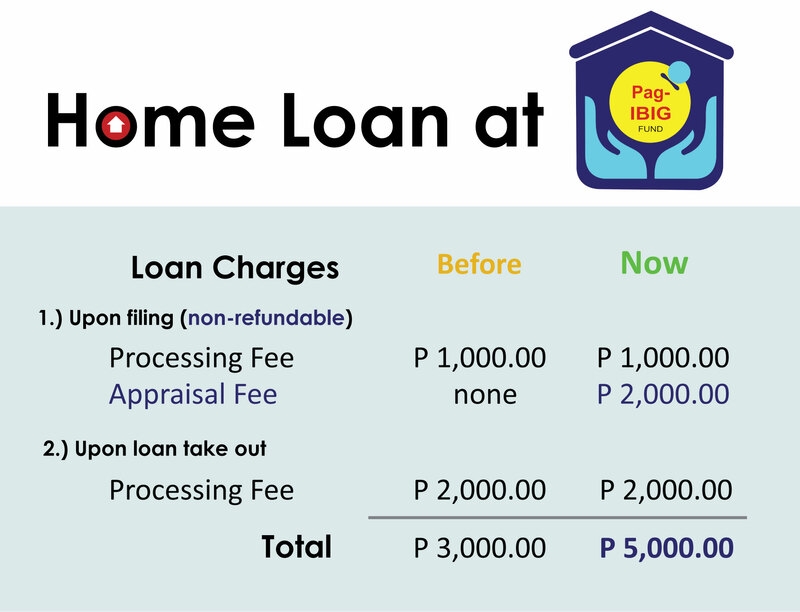 Know more about your housing loan options by visiting their webpage or their nearest Pag-IBIG office. What Pag-IBIG loan guidelines should be updated? Please share us what you think by commenting below. ask ko lang po kung alin po ang mas better regarding sa repayment period ng monthly amortization? Yung mag 30 years ang monthly pero nag aadvance or extra payment monthly o 15 years to pay? at alin po ang mas maganda? yung monthly na may advance o extra payment monthly o one time big amount na advance payment? sana po maintindihan nyo ang paliwanag kong magulo..salamat! I just want to know if the loan to appraisal value of 85% is also the 85% of he selling price? Appraisal are based on the actual cost of the property (land and building materials) — selling price can be higher (usually in a pre-owned property) or within the developer’s approved appraisal value (though they have regular price adjustments — of which the price difference will be added to your equity). Not sure po kung naitanong na sa inyo ang concern ko. Si buyer po kasi fully paid na ang equity sa developer need daw po magdadag ng bayad sa equity dahil mataas daw po ang appraisal ni pag-ibig sa corner lot. Meron po ba ganyang system si pag-ibig? Salamat po. There are instances that the appraisal can be low or higher on the final loan process, Pag-Ibig will inform the developer of the deficiency in which you will be readily advised. You will have no recourse but to pay since their appraisal is only for the regular sized lots, that is why usual practice of the developers is to charge you extra on larger cut properties that is in turn added to your equity term. May I ask how much would it cost me to pay my outstanding balance in Pag ibig ? We avail a 650k pag ibig housing loan in 2008 with a monthly amortization of 5k. 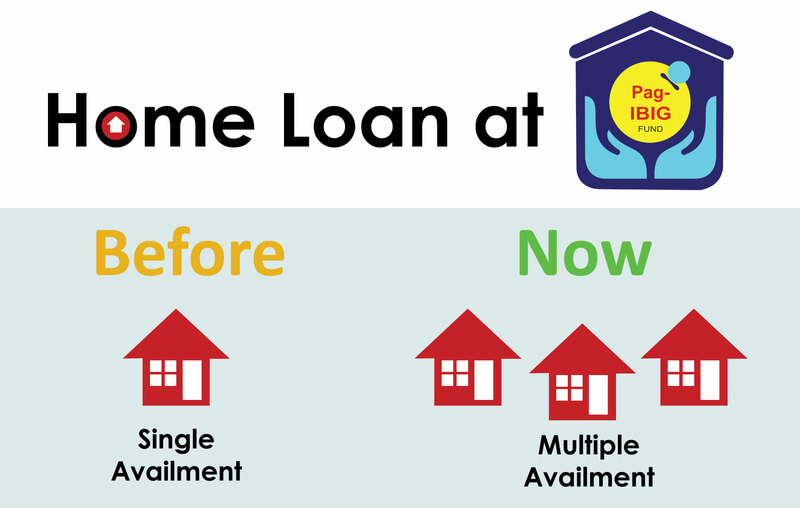 Now, we are planning to pay the remaining amount plus the interest by 2018 so we can close our loan with pag ibig. Could you help me to give the rough estimate cost of loan left? Ask for the statement of account of your home loan should you decide to pay it off —- Pag-IBIG home loan department will assist you on this. hi sir nag loan ako ng 450k po amount nag punta po si pag-ibig sa bahay na bibilhin ko e wala po tao . for appraisal mag kaka prob po ba yun ? clean title po sya sa tao na po bibilhn. Hindi po problema kung walang tao sa bahay nyo when the appraiser visited it — follow up lang with Pagibig office, baka they need to view pa the inside of your property, otherwise hindi po ito magiging problem.